Credits: "Samuel Zeller at Unsplash.com"
The theories and vocabulary of Chinese medicine can sometimes seem very different from the medical knowledge that we have through Western medicine. Although Traditional Chinese Medicine (TCM) practitioners may use different words and foreign concepts, does it mean we also get different results than Western medical providers? For example, in TCM we have no term for the endocrine system, but we have a wide variety of treatments available for what we would consider to be endocrine disorders in Western medicine. Similarly, while there is no concept of “wind” causing disease in Western medicine, there are treatments available in modern Western medicine for the condition that TCM providers would attribute to wind affecting the skin. One of the central theories that can create confusion is that of the internal organs. TCM practitioners often talk about disharmonies in your organs such as Liver Qi Stagnation or Heart Blood Vacuity. You may wonder what that it means? Why are these ideas different? Why do TCM doctors talk about your spleen more than your Western doctor ever does? This difference in vocabulary gives an insight into the fundamental differences in theory and methodology between Chinese medicine and conventional Western medicine. Both systems are independent, internally consistent systems that have been developed through an ongoing process of critical thinking, clinical observation, and testing. Despite their differences in theory and practice of healthcare, the goal of understanding the disease of the patient in front of you, and finding the appropriate and most effective treatment, remains the same. This article will explain more about the TCM theory of the internal organs, and what we can learn about the body through these insights from Chinese Medicine. 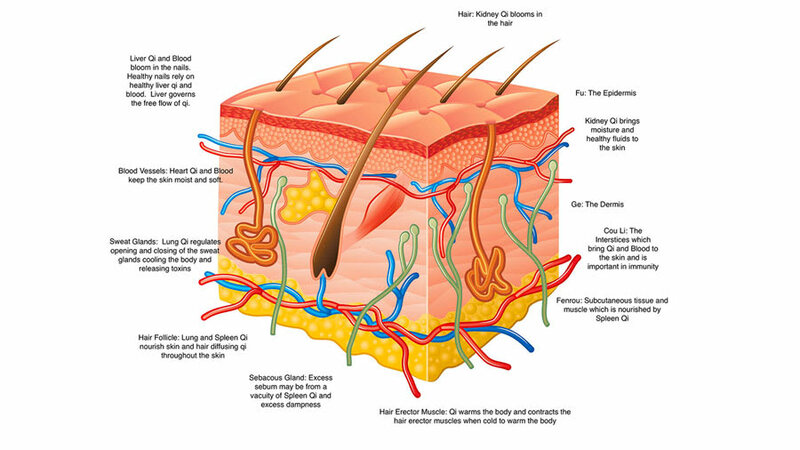 For a more detailed look at the various theories of TCM, and how they affect the health of your skin and your body overall, please read more in the Traditional Chinese Medicine Primer. One of the great strengths of Chinese medicine is its ability to detect disharmonies in someone’s health. Through your signs and symptoms, TCM practitioners recognize patterns of these disharmonies, and customize their treatments accordingly. It is thought that treating the disharmonies brings about long-term improvements in health. Often, these disharmonies are seen in your internal organs. However, rather than seeing the organs as a fixed anatomical structure, as it is in Western medicine, Chinese medicine sees a series of functions that are joined together in one organ. Chinese medicine is able to see each organ “as a complex energetic system encompassing its anatomical entity and its mental, emotional, and spiritual aspects”. That is, bodily functions are associated with emotions, mental activities, tissues, sense organs, and environmental influences are grouped into functional units and connected with the internal organs. When we talk about an organ in TCM, we are not only thinking of one anatomical structure, but we are thinking of a series of interconnected functions that we attribute to a vital organ. These functions can also include those organs associated and related organs, and how they all work together to carry out essential bodily functions. Note: It’s important to remember that when we talk about disharmony in an organ in TCM terms, this does not mean that there is a disease in the related Western medical organ. For example, if your TCM practitioner diagnoses you with spleen qi deficiency, it does not mean that you have a disease of the spleen. It only means that there is a disharmony seen in one of the functions attributed to the spleen by TCM. This could mean that you are experiencing bloating or loss of appetite, something that would likely not be attributed to any disease seen in your anatomical spleen by your Western medicine physician. In TCM theory, there are two primary types of organs: solid and hollow. 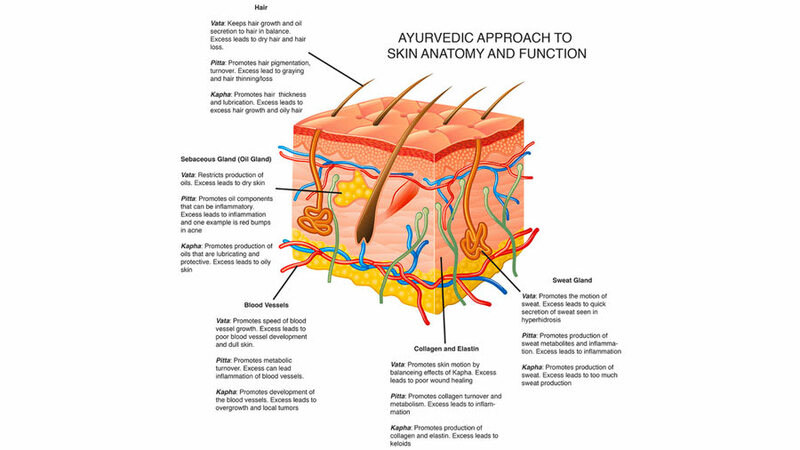 Solid organs produce, transform, and store various substances in the body. Each of these organs is paired with another organ that receives, breaks down, and excretes these substances (also called “hollow” organs). There are five vital solid organs: the heart, lung, spleen, liver, and kidney. Each of these organs is paired respectively with another hollow organ: the small intestine, large intestine, stomach, gallbladder, and urinary bladder. A good example of this is the kidney and urinary bladder. The kidney creates and stores the urine (a “solid” organ that transforms and holds onto the urine) and the urinary bladder receives and excretes the urine (a “hollow” organ that expels the urine). There are also several miscellaneous organs mentioned in classic texts, including the brain, marrow, bone, blood vessels, and uterus. Our focus today is primarily on the organs that produce and transform substances, the solid organs, as they are the center of TCM organ theory. The functions of the paired hollow organs are oftentimes explained within the function of the solid organ. According to TCM, each of the five vital organs has an emotion that is associated with it. “The relationship between each organ and a particular emotion is mutual: the state of the organ will affect the emotions, and the emotions will affect the state of the organ.” This means that in Chinese medicine we see five primary emotions (anger, sadness, joy, pensiveness, and fear), and each of these emotions has a profound effect on their matched organ. These emotions can have an effect on the functions of their paired organs, and likewise, disharmonies in an organ can affect the emotion that is paired with it. For example, a common symptom of disharmony in the spleen is bloating. Because pensiveness is the emotion paired with the spleen, excessive pensiveness or worry can lead to digestive disturbances like bloating and poor appetite. Additionally, each organ is paired with a particular climatic condition. Prolonged exposure to heat, dryness, cold, dampness, or wind can adversely affect the related organ. Also, a weakness in the organ can also make a person more prone to disease when exposed to that climate. Exposure to one of these conditions can be from internal or external sources. For example, you can have excessive exposure to dampness if you live in a very humid climate (external exposure). 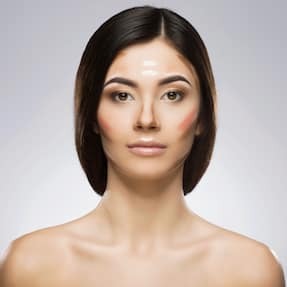 You can also be exposed to too much dampness if you have a diet high in damp foods such as dairy products, greasy fried foods, or rich, fatty meat (internal exposure). To continue our previous example, dampness is the climatic condition that primarily affects the spleen. Prolonged exposure to dampness (either through living in a humid climate or eating a diet of damp foods), can lead to symptoms seen in spleen disharmony like poor appetite, loose stools, bloating, and fatigue. The theory behind Chinese medical diagnosis is complex, and what is offered above is just an initial glimpse into the ways in which imbalances in these vital organs can affect your health. For more complete information about these organs, and how you can treat your body’s disharmonies, contact your Chinese medical practitioner for a consultation. The heart holds an important place in medical theory, both Chinese and Western. Not only does it govern the blood vessels and the movement of blood within them, in Chinese medicine, it is also the storage place of the mind/spirit. This means that many diseases and conditions of not only the cardiovascular system but also the nervous system are treated as heart diagnoses in TCM. Additionally, while joy is the emotion most closely associated with the heart, an excess of or prolonged exposure to any emotion (such as grief or anger), can also affect the heart. The lung, in Chinese and Western medicine, controls breathing. Additionally, in TCM we see the strong connection between the lung and the immune system, as the lung is in charge of resisting the “invasion of external evils.” The lungs are often the first organs to be affected by an external invasion (of wind-cold or wind-heat) and are often called the “delicate” organ. 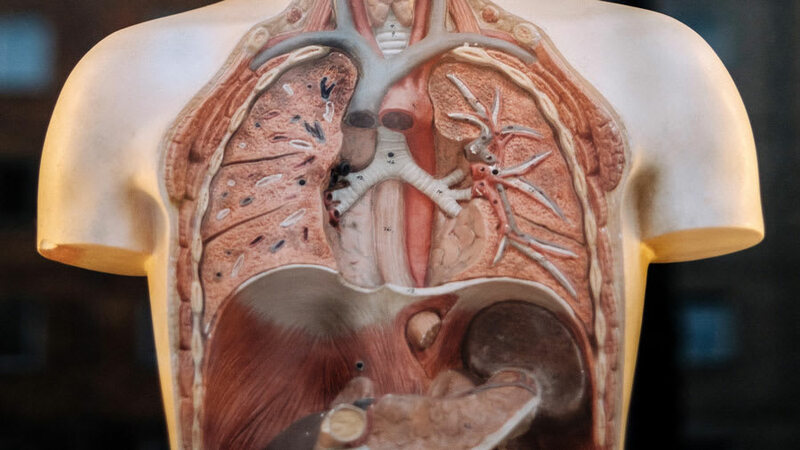 Through the lung, we see diseases of the respiratory system, disorders fluid metabolism, some circulatory diseases, as well as many skin conditions. The liver stores blood, governs the tendons, and the free movement of blood. The liver ensures that our tendons, muscles, skin, and joints are properly nourished and that blood circulation is effective. This movement of blood also affects menstruation in women. The liver has a close relationship with the gallbladder, which among other functions, secretes and discharges bile, just as it does in Western medicine. For more information on the liver’s relationship to the nails, please see the article Traditional Chinese Medicine Approach to Nail Health. The spleen “governs movement and transformation of grain and water,” as well as the formation of blood and its distribution around the body. The paired yang organ of the spleen is the stomach, and these two organs share a very close and interconnected relationship. Along with the intestines, the functions of the spleen and stomach encompass digestion and assimilation. While the stomach’s role focuses on moving food downward, according to TCM theory, the spleen is in charge of keeping food, waste products, blood, and organs up and in their proper place. Symptoms like vomiting or acid reflux (substances moving upward inappropriately) are usually attributed to a disharmony in the stomach, but symptoms like organ prolapse, diarrhea, and easy bruising are usually seen with a disharmony in the spleen (organs, waste, and blood are not being held up or held into their appropriate places). The kidney is an essential organ for proper growth and development in Chinese medicine. It is the basis for reproduction and our body’s ability to grow and age properly. It governs the bones and the water of the body, as well as producing bone marrow. The kidney is also needed for normal functioning of the rest of the organs of the body. It has a close relationship with the urinary bladder, which, according to both Chinese and Western medicine, stores and discharges urine . Kaptchuk TJ. The web that has no weaver: understanding Chinese medicine. 2nd ed. New York, NY: McGraw-Hill; 2000.